IMAGE: Mumbai’s Wankhede Stadium during Sachin Tendulkar’s farewell Test match. .
Mumbai Cricket Association (MCA) on Thursday decided to substantially lower the ticket rates of popular stands for India's Test match against England at the Wankhede Stadium scheduled from December 8-12 as compared to the prices for Sachin Tendulkar's farewell game in 2013. "We have decided to keep the ticket rates cheaper as compared to the rates we had maintained during the Tendulkar Test match," MCA sources said after a meeting of its Managing Committee chaired by President Sharad Pawar. The cheapest daily ticket for the match, the fourth of the five-game rubber, would cost the fan Rs 100 to be seated in the Sunil Gavaskar East Stand (lower level), while the rate for the season ticket (all 5 days) has been kept at Rs 300 as compared to Rs 200 and Rs 500 three years ago. 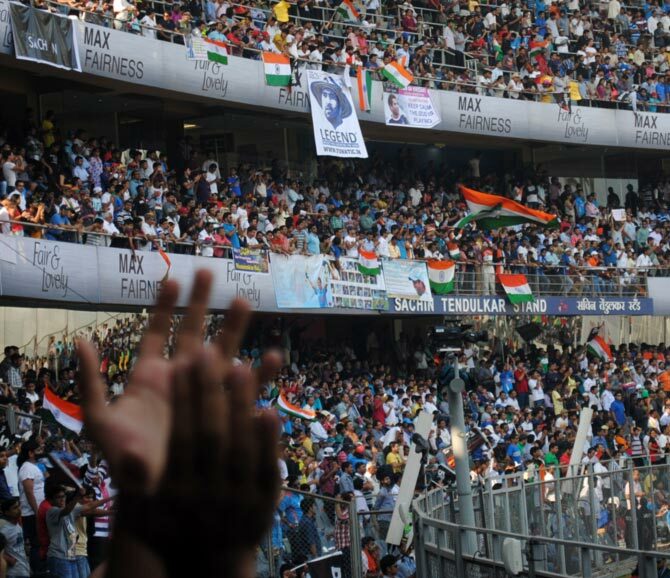 Tickets for the upper tier of the same stand would cost Rs 150 (daily) and Rs 500 (season), respectively in comparison to Rs 300 and Rs 1,000 for the game against the West Indies in November 2013 where Tendulkar bid farewell. There would also be a special enclosure in the Sachin Tendulkar stand in the north side of the stadium costing Rs 10,000 (season), which would be a hospitality enclosure and is set to attract fans from the visiting side like the "Barmy Army". "They would be given snacks and lunch like we had done three years ago. We expect mostly visiting fans to buy them although Indians can also pick them up," the sources said. The rates of tickets for other stands, like the Garware Club House, Vithal Divecha and Vijay Merchant, have also been slashed. The costliest tickets have been reserved for the 15 and 20-seater corporate boxes at Rs 5 lakh and Rs 6.7 lakh, respectively for the duration of the game and the same seat would cost Rs 30,000 per day. The corresponding rates were Rs 5 lakh and Rs 7 lakh in 2013. Meanwhile, MCA have released two of its Ranji players - all rounder Iqbal Abdullah and opener Bhavin Thakkar – to play for Kerala in the coming Ranji season by giving them NOC (no objection certificate).